The objective of this lesson is show you how to write ratios using some situations or examples you encounter daily . Things are not always the same size. Thus, a natural need arise to compare quantities using division to see how much bigger a quantity is when compared to another. For example, looking at the two piles below made of red apples and green apples, you may not be satisfied just to know that there are more red apples. 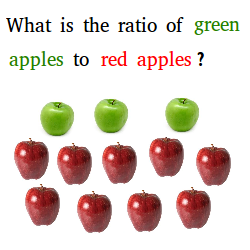 A comparison of red apples to green apples using division may help you to see how much more red apples there are. 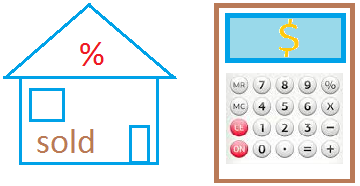 The quotient or answer to the ratio above is equal to 3 and we can quite interpret the answer. Say for instance, you are in a classroom. In the classroom, there are 3 boys and six girls. It means that there are half as many boys as girls in the classroom. is equal to 2 and it means that there are two times as many girls as boys in the classroom. At this point you may have noticed that the order is important when defining a ratio. The number that comes after ' of ' is your numerator and the number that comes after ' to ' is your denominator. A ratio is a comparison of two numbers using division. A little word problem: A classroom has 50 students and the ratio of males to females is 2 to 3. How many students are females? Take the quiz below to see how well you understand the lesson on this page.